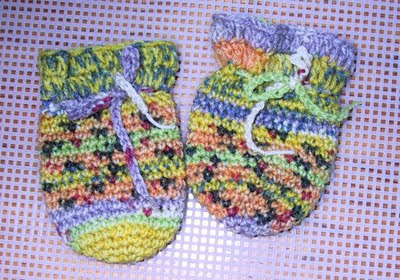 Many thanks to Diane P for testing this pattern. 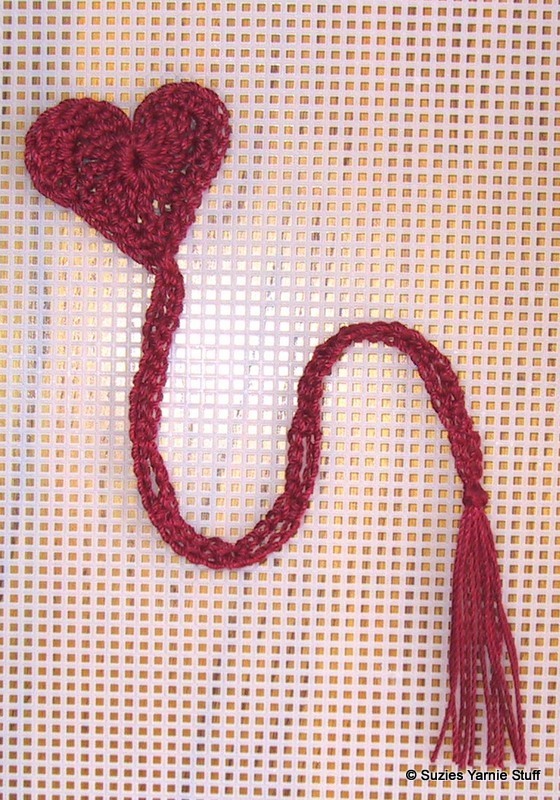 Worked in size 3 thread the heart is about 2 inches across. NOTES:1. Read instruction all the way through before beginning bookmark. 3. 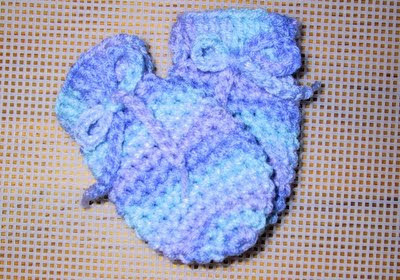 I used J&P Coates Royale Fashion crochet thread. Round 1: Chain 4, make all stitches in the first chain. 3 tr, 3 dc, chain 1, 1 tr, chain 1, 3 dc, 3 tr, chain 2, slipstitch. Round 2: Chain 3, in first tr make sc and hdc, in next stitch 3 hdc, in next stitch 2 hdc, 1 sc in next 4 stitches, ch 1, dc in tr. Ch 59 (69 for size 10 thread), sc in the 10th ch from hook to form ring. *Ch 4, skip 4 sts, sc in next ch. Repeat from * until 4 chains remain, slipstitch in dc. Ch 1, sc in next four stitches, 2 hdc in next stitch, 3 hdc in next stitch, hdc and sc in next stitch, chain 3 and slipstitch at base of beginning ch 3. 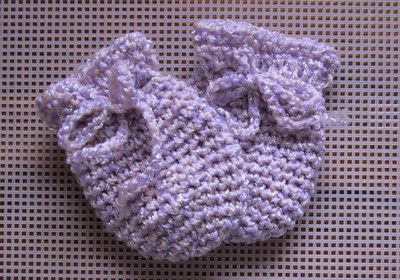 Many thanks to my testers, Jo in NY and Darlene K.
2. Ch 3, dc in 2nd ch from hook and in next ch. For lack of a better name I call this a scallop. 3. About slipstitches, pull tight the joining ones, but not the ones in the top of the scallops. 4. If the larger size is a bit too large, switch to a G (4.5 mm) hook for the last 4 rounds. ROUND 3: Ch 5. 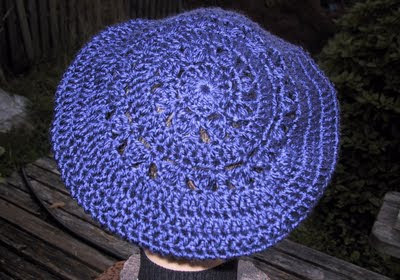 *Slipstitch in center st of scallop, ch 2, dc in sc, ch 2 . Rep from * around. 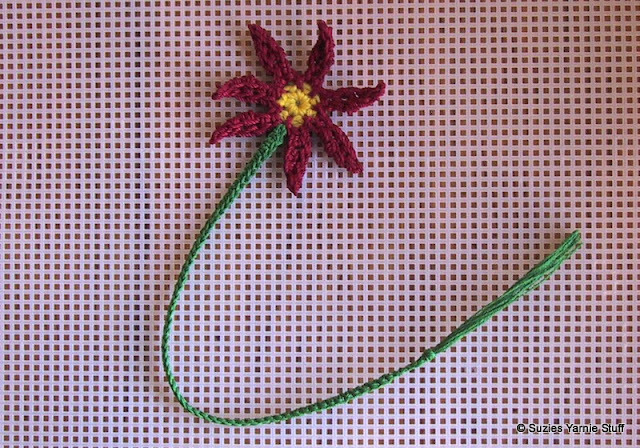 Join with a slipstitch in 3rd ch of ch 5 (48 sts). ROUND 6: Ch 5. 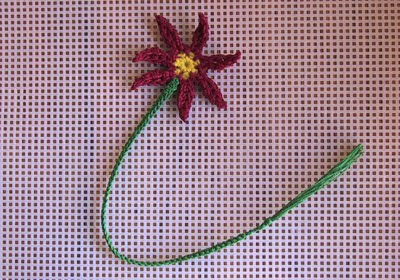 *slipstitch in center st of scallop, ch 2, dc in sc, ch 2 . Rep from * around. Join with slipstitch in 3rd ch of ch 5 (96 sts). Thanks Cherie for testing this pattern. SIZE: 750ml bottleNOTES:1. Read instructions all the way through before beginning. 3. There are instructions to crochet a chain for a tie. But I like the look of 30 inches of ribbon used as the tie. TIE: Ch 70. Weave tie in and out of the V-sts of round 18. 3. Due to the nature of Fun Fur the bag is worked loosely. 4. 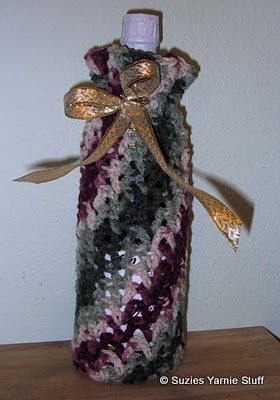 I find that the wrong side is furrier than the right side, so I turn the bag wrong side out before inserting wine bottle. TIE: Weave ribbon in and out of the V-sts of round 13. Straps: Before felting 21 inches. After felting 18 inches. 2. Decrease used isn’t your conventional hdc dec, but what seems to work best for this pattern. Decrease (dec over 2 sts); yarn over, insert hook in next st, yarn over and pull loop through, yarn over, insert hook in next st , yarn over and pull loop through, yarn over and pull through all 5 loops of hook. 4. When working in the back loop of the hdc work into the VERY back loop leaving two loops on the front free. 5. Always crochet over the tails when possible. 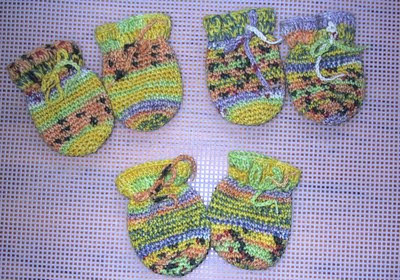 They will be locked in place by the felting process. 6. Check your bag often during the felting process. The straps tend to tangle and you will need to untangle and give them a stretch. 7. 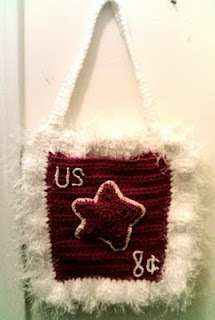 The photos of the bag before felting show a 7 ruffle version, don't let that confuse you. 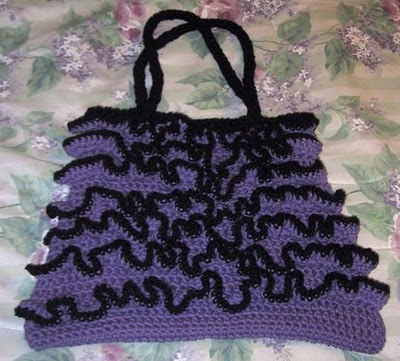 Ruffle Row 1: Lay bag flat with the bottom of the bag at the top. Mark the third st of unused loops of the hdc of rounds 5, 9, 13, 17, 21 and 25, on the right and left sides. These sts are where the ruffles begin and end. With bottom of bag up, attach main color yarn with a slipstitch in the right hand marked st. Ch 2, 2 dc in same st. 3 dc in each st across to the other marked st. 3 dc in last st. Fasten off. Repeat the ruffle using the other rounds of unused loops. You will have 6 ruffles on one side of bag. Ruffle Row 2: Attach the trim color with a sc in the first st of ruffle row 1. Sc in each st across. Fasten off. Round 1: With I hook, leaving an 8 inch tail, ch 2, 5 sc in second chain from hook. Do not join. Round 2-until 21 inches long: Sc in back loop of next sc. Continue working sc in back loop until cord is 36 inches long. You will be working from the inside of a tube. Lay bag flat and mark 3 ½ inches in from each side on front and back. These are the locations where you will sew the ends of the straps in place. Using a yarn needle attach the straps at the markers. (One strap to each side.) When sewing the strap, place the bottom of the strap at the base of the welt round. 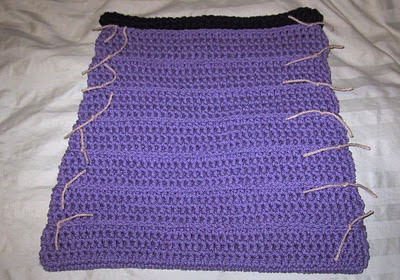 Reinforce the area where the handles and bag are joined by weaving the tail back and forth through the stitches several times. Remove all markers. 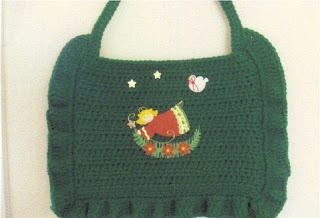 Here are the entries in the 2009 Christmas Card Pouch Contest. The members of our Yahoo Group voted and Shawn is the winner. Shawn's entry is the green one. Thank you both for entering the contest. The prize is on it's way. 12/14/09 Shawn received her prize today. Here is what she won. 2. The first 15 rounds are worked in continuous rounds. Move your marker up every round. Mitt should measure about 3.25 inches. Chain 55, Fasten off. Weave in and out of eyelet round. Tie in bow. 2. The first 14 rounds are worked in continuous rounds. Move your marker up every round. Mitt should measure about 3.5 inches. Chain 50, Fasten off. Weave in and out of eyelet round. Tie in bow. 2. The first 19 rounds are worked in continuous rounds. Move your marker up every round. Okay confession, I only used a marker for the first 5 rounds, once I was working even I just counted the rounds and eyeballed it. Mitt should measure about 3 inches. Chain 70, Fasten off. Weave in and out of eyelet round. Tie in bow. 3. 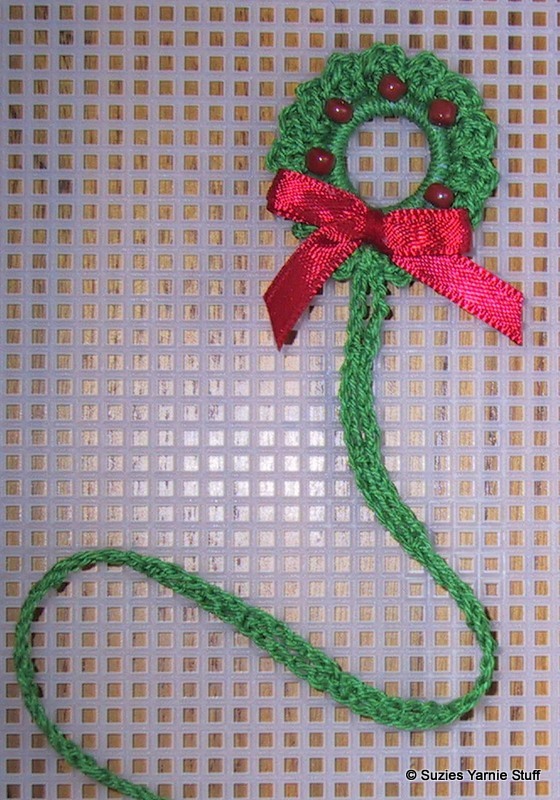 Wreath can be worked with a larger elastic and yarn with an appropriate size hook. 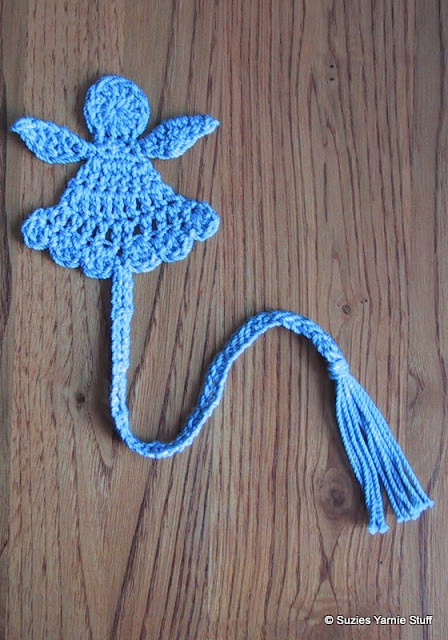 For pin, ornament or fridgie fasten off. For bookmark continue below. Ch 69, sc in 10th ch from hook, to form ring. *Ch 4, skip 4 sts, sc in next ch. Repeat from * until 4 chains remain, slipstitch in same st as first ch. Fasten off. 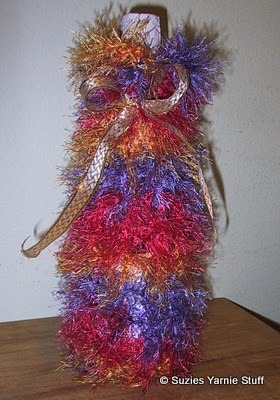 Weave in ends.TASSEL:Cut 6 strands of thread about 6 inches long. 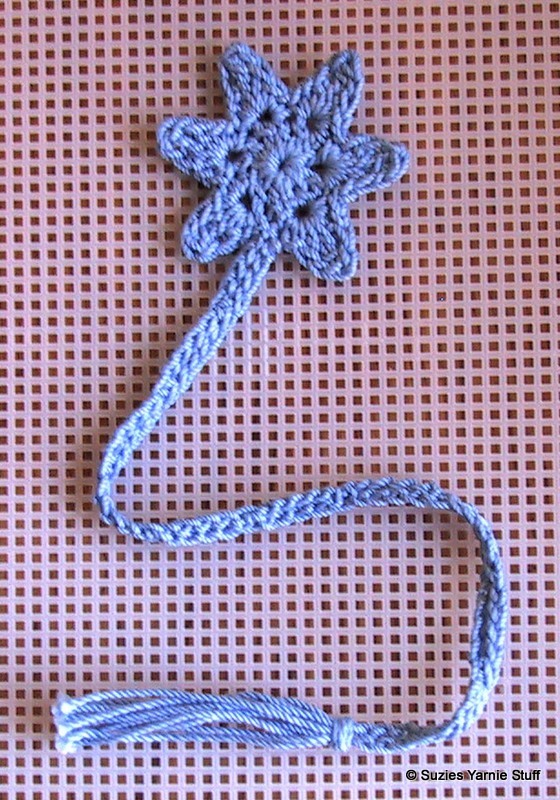 Fold in half and draw loop through the circle at end of tail with a crochet hook. Draw the loose ends of the strands through the loop and pull them down tightly to form a knot. Trim ends of tassel evenly. Glue on bead berries and bow. 4. A smaller poinsettia can be crocheted with size 10 thread and a size 7 steel hook. 5. For bookmark instructions see here. Mix 1 part liquid starch with 2 parts water. Wet the bookmark with the starch solution. Squeeze out excess and lay on a towel. 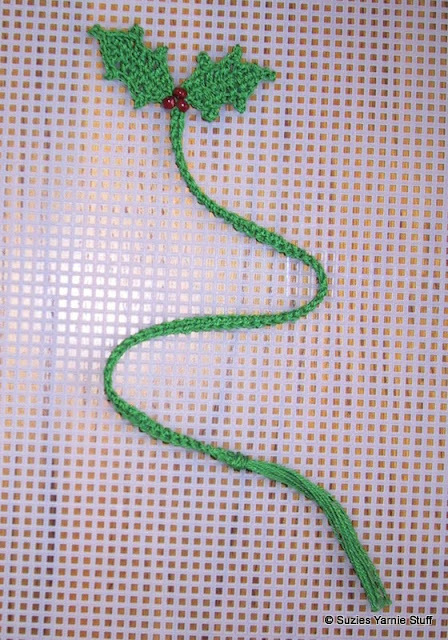 Shape the poinsettia and tail, allow to dry. Attach green with a slipstitch in any slipstittch between petals. Ch 70, sc in 10th ch from hook, to form ring. Sc in each ch, slipstitch in same st where green was attached. 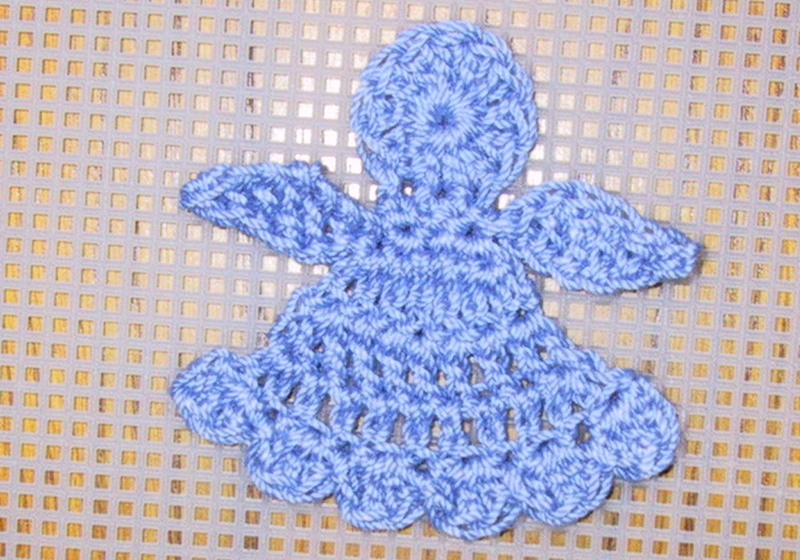 If crocheted of size 10 thread and appropriate hook angel will be about 1.75 inches. Ch 1, slipstitch in next head st, sc in next st, slipstitch in next st. Don’t pull these slipstitches tight. 1st wing: Ch 8, sc in 2nd st from hook, hdc, dc, tr, dc, hdc, sc across the next 6 chains. Twist work and slipstitch, sc, slipstitch in 3 sts of the neck. 2nd wing: Ch 8, sc in 2nd st from hook, hdc, dc, tr, dc, hdc, sc across the next 6 chains. Twist work and 2 sc in first st sc in next st, 2 sc in last st of neck. Ch 2, turn. Row 4: 3 dc in first st, *slipstitch in next st, 3 dc in next st. Repeat from * four times. 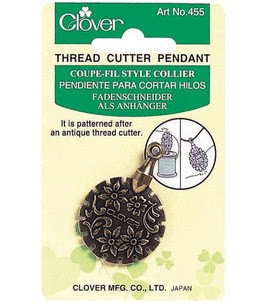 Slipstitch in last st.
Stiffen with your choice of stiffener. I use Vano liquid starch. I mix it 50/50 with water. 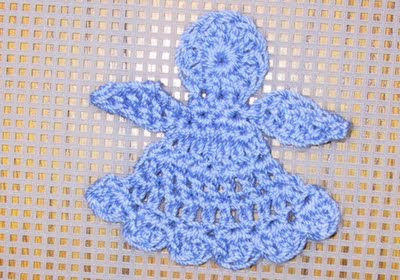 Soak your angel, squeeze out the excess. I don't pin mine down just lay on a towel and shape. Allow to dry. Twist work and 2 sc in first st, sc in next st, 2 sc in last st of neck. Ch 2, turn. Row 4 and Tail: 3 dc in first st, *slipstitch in next st, 3 dc in next st. Repeat once. Ch 49, sc in 10th ch from hook, to form ring. *Ch 4, skip 4 sts, sc in next ch. Repeat from * until 4 chains remain, slipstitch in same st as first ch. 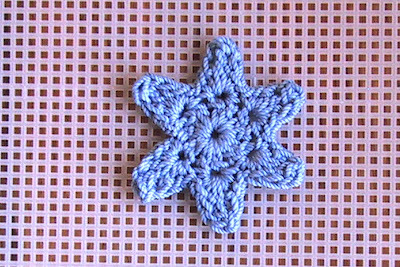 3 dc in next st, *slipstitch in next st. Repeat once. 3 dc, slipstitch in last st. Mix 1 part vinegar with 5 parts water. Wet the bookmark with the vinegar solution. Squeeze out excess and lay on a towel. Shape the angel and tail, allow to dry.